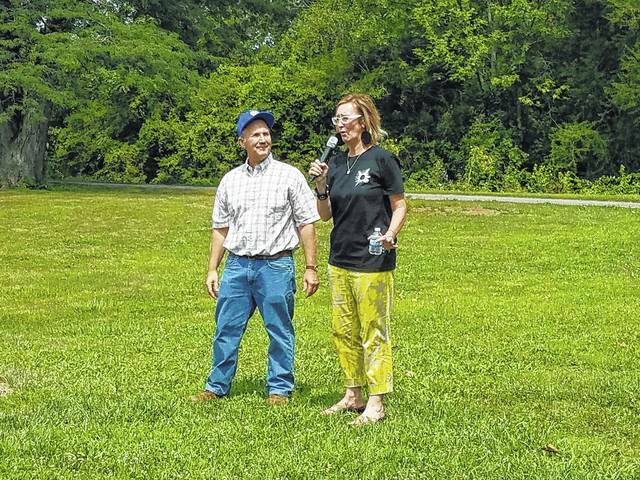 Paul LaRue and Lorre Black talk to the community during the Black Sky Project on Monday to view the Great American Eclipse together. Music from several genres was played and residents enjoyed the park while waiting for the eclipse to begin. Fayette County was within the range of 90 percent totality, meaning that the majority of the sun was blocked by the moon. The peak occurred around 2:30 p.m. and was captured by telescope for the community to watch. This photo was taken near the beginning of the process and shows roughly 25 percent of the sun already covered. Kay Oughterson (at left), Lorre Black’s mother, and Wanda Coil represented the local Kiwanis Club during the event by greeting residents. Oughterson was also celebrating her birthday Monday. Using special protective glasses, people could watch the eclipse in real time as the moon enveloped the sun. https://www.recordherald.com/wp-content/uploads/sites/27/2017/08/web1_20170821_133115.jpgPaul LaRue and Lorre Black talk to the community during the Black Sky Project on Monday to view the Great American Eclipse together. Music from several genres was played and residents enjoyed the park while waiting for the eclipse to begin. 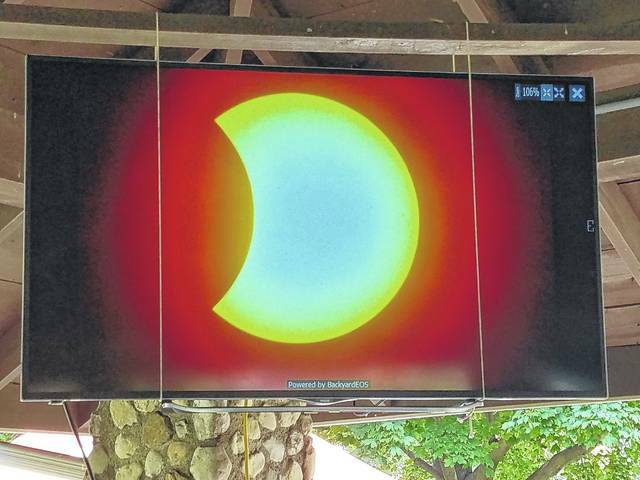 https://www.recordherald.com/wp-content/uploads/sites/27/2017/08/web1_20170821_133230.jpgFayette County was within the range of 90 percent totality, meaning that the majority of the sun was blocked by the moon. The peak occurred around 2:30 p.m. and was captured by telescope for the community to watch. This photo was taken near the beginning of the process and shows roughly 25 percent of the sun already covered. 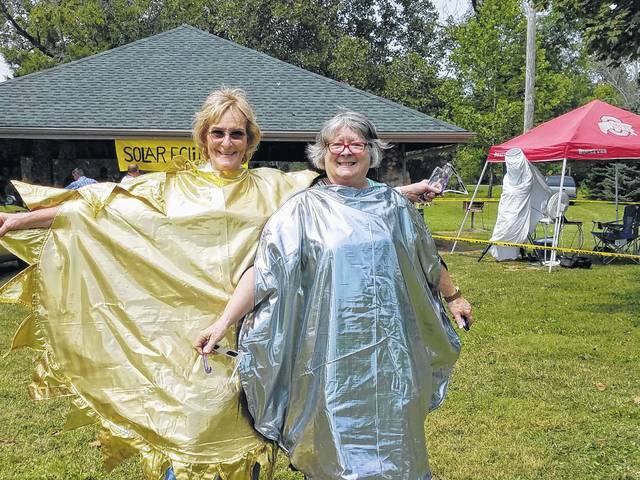 https://www.recordherald.com/wp-content/uploads/sites/27/2017/08/web1_20170821_133515.jpgKay Oughterson (at left), Lorre Black’s mother, and Wanda Coil represented the local Kiwanis Club during the event by greeting residents. Oughterson was also celebrating her birthday Monday. 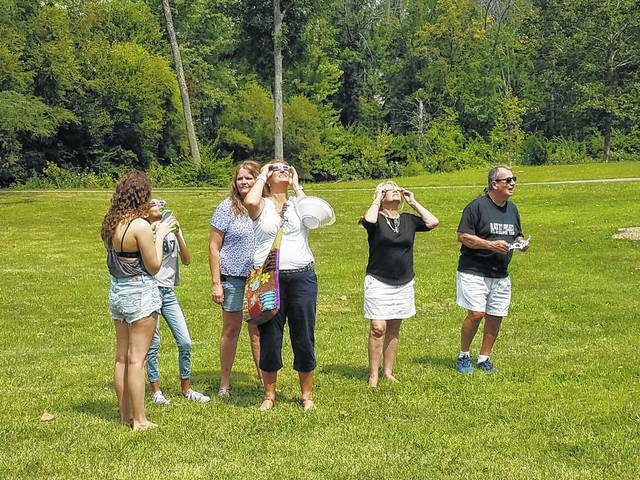 https://www.recordherald.com/wp-content/uploads/sites/27/2017/08/web1_20170821_142845.jpgUsing special protective glasses, people could watch the eclipse in real time as the moon enveloped the sun.